Now sold at Beauty Ecology, our signature line "EVOQ Beauty" offers a trusted collection of hemp plant infused lifestyle and skin care products formulated with a leading Global hemp leader that cultivates your transformative tinctures from a precision laboratory with practices backed by the FDA, cGMP, Pharmacy ISO 9001 compliant facilities, all of which carry organic/kosher certifications. Take your time and dive deep into the extensive NEW research and solutions within chemistry, genetics, research, strain cultivation, and extraction sciences gives you assurance in a transitioning non-regulated and rapidly hemp growing industry. Phyto-cannabinoid (CBD) is a hemp plant extract that offers all the healing benefits of the plant without the psychoactive high. CBD directly enhances our endocannabinoid ecosystem (ECS). The human body contains millions of cannabinoid receptor sites in our endocrine system. CB1 receptors are primarily located in the brain, along with the lungs, liver, and kidneys. CB2 receptors are found mostly within the immune system. 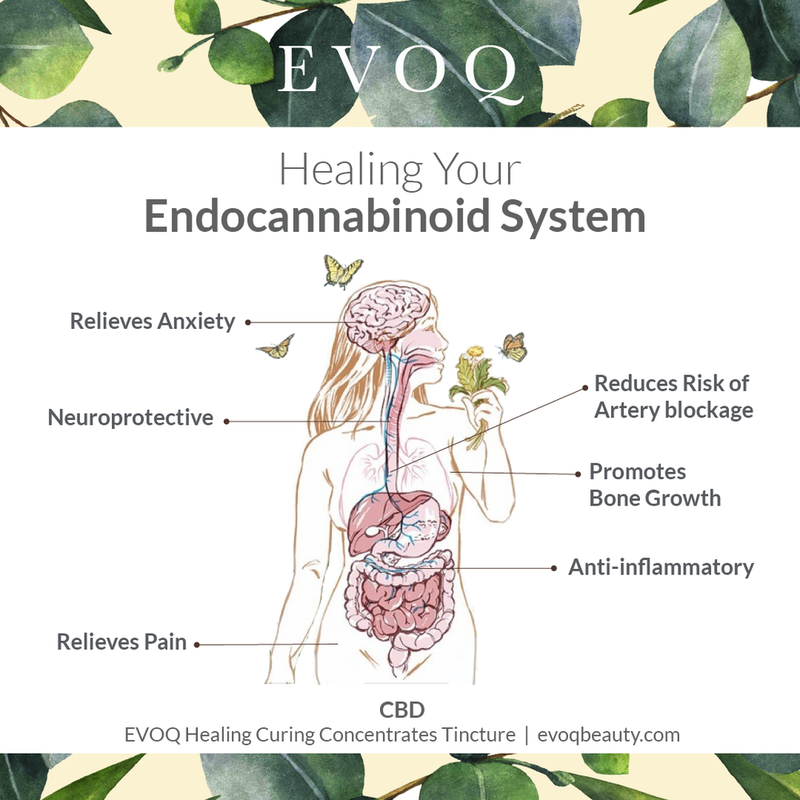 Our endocannabinoid system (ECS) is a living neural network regulating the intrinsic tissue in our body and is made up of millions of receptor sites which signal molecules and hormones throughout our body to either activate healing or signal discomfort. Because the ECS regulates homeostasis, an imbalance in the body’s ECS could be the underlying cause behind many diseases and disorders from inflammatory and autoimmune diseases to depression, fatigue, and chronic pain. When activated, CBD receptor sites produce a heightened sense of well-being, elevated health, and enhanced energy. Due to our stressful lives, many suffer from inefficient mitochondrial function causing fatigue, leaky gut syndrome, anxiety and oxidative stress (accelerated aging). CBD helps proper genetic cell to cell communication where the conversation in our body becomes a pleasant and resonate one that brings satisfaction and fulfillment. Our healing CBD solutions focus on maintaining inner-outer homeostasis and building well-being and vitality while supporting healthy aging. Enjoy a refreshing citrus + mint flavor with pure bioavailability with cannabinoids, terpenoids, essential oils and essential mighty omega oils. Plant terpenes are added for higher enhancing potency and bioavailability to balance your inner Cannabinoid (ECS) receptor sites uniquely to you for hightened joy, a strengthened immune system, sense of balance, positive and a more focused mental health. Our full spectrum hemp complex contains non-psycho­active phytocannabinoids, fatty acids and botanical terpenes meticulously blended for a more readily absorbed delivery method so your inner-biology ecosystem can receive a faster and targeted relief and better product performance. Each serving includes 25 mg of CBD. Day and Night: Take 1-2 droppers under the tongue. Your Tincture is extremely clean, active and pure. Non-GMO, 100% vegetarian and gluten free. No heavy metals, pesticides or residual solvents that can be found in other products. COA Lab and Batch Verification tests available upon request. Grown in the EU without the use of pesticides and herbicides in order to achieve high quality and safe products. Terpenes are the fragrance molecules found emanating from all plants - including cannabis, which offers a unique scent from one strain to the next. The fragrant imprint of each plant is a result of different combinations of terpenes. Cannabis is unique in that each strain has a unique profile of terpenes. Terpenes are believed to exhibit medicinal properties independent from the cannabinoids. Overall, terpenes contribute to a strain's particular influence - a phenomenon known as the entourage effect. Beta-myrcene is the most common terpene in cannabis, and it is also found in hops, eucalyptus, mango, bay leaves, and lemongrass. Its aroma has been described as “herbal, balsamic, rooty, or spicy.” It helps ease pain and inflammation, and it relaxes muscles. Limonene is the second-most-common terpene in cannabis. The aroma is found in citrus plants and is commonly used in lemony-fresh cleaning solvents and natural insect repellants. Limonene fights tumors and bacterial infections, stimulates the immune system, relieves depression and anxiety, and treats gastric reflux and ulcers. As you might guess from the name, this compound is commonly found in pine trees and other coniferous plants. It helps dilate the bronchial tubes, reduce inflammation, kill bacteria, and increase cognitive function. Like many cannabinoids, beta-caryophyllene binds to the CB2 receptor, found mostly in the immune system. Beta-caryophyllene is antibacterial and antiseptic, and it eases inflammation, nerve pain, ulcers, and depression. Evoq never takes shortcuts when it comes to creating your CBD rich products.